Deadliest Warrior returns with the most legendary warriors in history ready to battle to the death. Bring the legends to your Xbox 360 Dashboard with the flaming castle courtyard theme. This Premium Theme features William Wallace, Shaka Zulu, Vlad the Impaler and more. 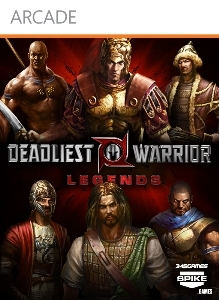 Download Deadliest Warrior: Legends on Xbox Live Arcade. For more info on the game, go to www.DeadliestWarriorTheGame.com.